Professional home whitening fees are £344. A deposit of £45 is taken which will cover you for a full dental exam and xray report to ensure you are dentally fit and suitable for whitening. 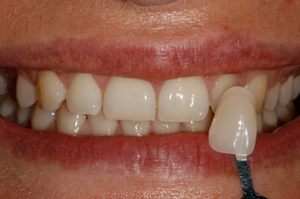 If you are suitable the impressions for your customised bleaching trays will be taken and the balance will be payable. If you are not found to be dentally healthy we will either provide you with a quote for any work that you may need or you can return to your own dentist to complete the work before returning to us to complete the whitening. If you have any questions regarding our teeth whitening Cardiff service then please contact us . 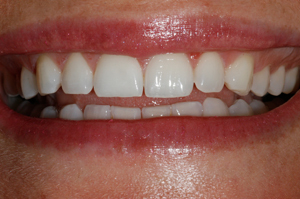 We get great results from teeth whitening, or dental bleaching, for our patients here at Park Place Dental by using a Professional Home whitening with custom made trays. This is an excellent way to brighten yellowed, discoloured or stained teeth. Impressions are made at the first visit and the custom whitening trays to hold the whitening gel against your teeth are made at our lab in Cardiff. At the 2nd appointment the custom made trays are delivered and we record an initial shade to keep track of your progress. Special whitening gel will be dispensed at this visit also with detailed written instructions to get the best results. 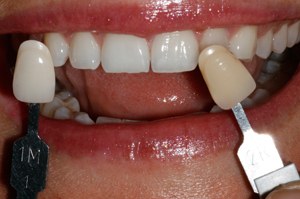 The whitening trays with the gel will need to be worn 2-4 hours a day for approximately 2 weeks. 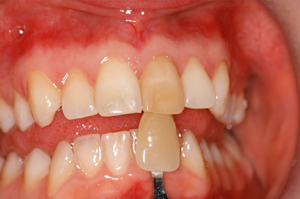 This is a patient before the have used the tray whitening for 10 days. 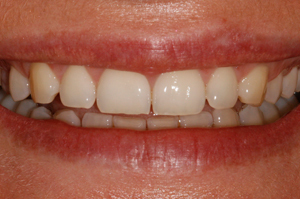 This is the same patient 10 days later showing much whiter teeth with the original shade shown. 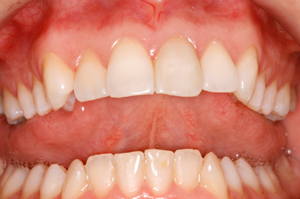 Some teeth respond better to whitening than other. Please be aware that existing crowns, veneers and fillings will not change colour from this procedure and also very deep internal stains will not whiten with this type of procedure. A dental exam is done prior to starting this procedure to ensure you get the best results and are made aware of any limitations before starting this treatment.